﻿﻿﻿The Houston toad is struggling to make a comeback. ﻿﻿Growing up in Houston, I was familiar with the typical sounds of the big city beyond my suburban home. It wasn’t often that I got the chance to hear a chorus of toads rise up, rather shyly, above the cars roaring along the freeway next to my neighborhood, but it was always a treat when I did. Back then, I might have — probably had, in my young mind — named the toad I heard the Houston toad. As it turns out, the Houston toad (Bufo houstonensis) is a real animal, but probably not the source of the cadence I heard: the Houston toad hasn’t been reported in its namesake city since the 1970s. Nowadays, these toads have their largest population in Bastrop County. 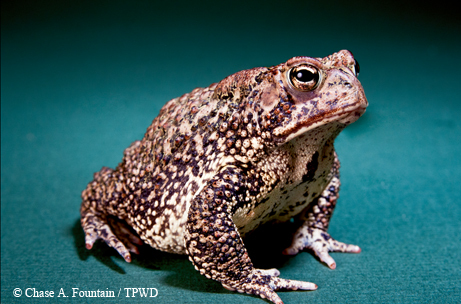 Unfortunately, the 2011 Bastrop fires destroyed much of the remaining quality habitat for the toad, putting the fate of the already endangered toad further in jeopardy. The drought preceding the fires had already reduced toad numbers, but the fire caused the population to dwindle to a new low through both mortality and loss of habitat and food. Recovery efforts began immediately, with some success. Last spring, the numbers were up to about 60 Houston toads at Bastrop. Thousands of tadpoles were released into ponds there, but mortality rates are high for the toads. Success could be the survival of fewer than a dozen of these tadpoles through maturity. John Wottring first heard the Houston toad’s trill more than 60 years ago, and the bumpy, brown-skinned creature was first dubbed the Wottring toad. As time went on, though, the toad gained its new name. A Houston toad is typically brown in color but can also be purplish-gray or gray. Its pale underbelly is often littered with dark speckles. Females are larger and bulkier than males. Houston toads typically live in woodland savannas with deep sand that they can dig up easily. When conditions get harsh, they burrow into the sand and remain dormant until the weather gets better. Males can be heard trilling on spring evenings. You usually hear toads early in the year because February and March are the peak months of the Houston toad’s breeding season. However, male Hous­ton toads may spend half the year — from January to June — calling out to and trying to find potential mates. They wait for favorable temperatures and humidity to breed. Houston tadpoles mature in the pond in which they were born and then leave to look for sustenance, such as insects and other invertebrates. In their search, Houston toads can travel up to a mile in 24 hours. Despite the chemicals they secrete to ward off predators, young Houston toads can fall prey to animals such as raccoons, snakes, owls and larger frogs. The next time I make the drive from Austin to Houston, I’ll think about Houston toads when I pass through Bastrop County. If I’m lucky, maybe I’ll even get to hear a chorus trilling in the early evening hours.